We’re rounding the corner, aren’t we? Thanksgiving comes this week … then the holiday rush is upon us … then, well … it’s GO TIME. It’s very tempting to take this time between the just-completed extension season and the beginning of January to rest and let what comes of tax season be of the harvest which you may have reaped from last year, and over the course of this calendar year. That would be a critical mistake. I have two BIG resources headed your way in December. One relates to sprucing up your online marketing presence to become a lead-magnetizing machine (a brand new webinar). The other will be about how you can BLANKET your market area with extremely low-cost direct mail and get bushels of new clients streaming into your office(s). You’ll hear from me soon about these two important resources. However, there are other aspects of preparation that are equally as important. 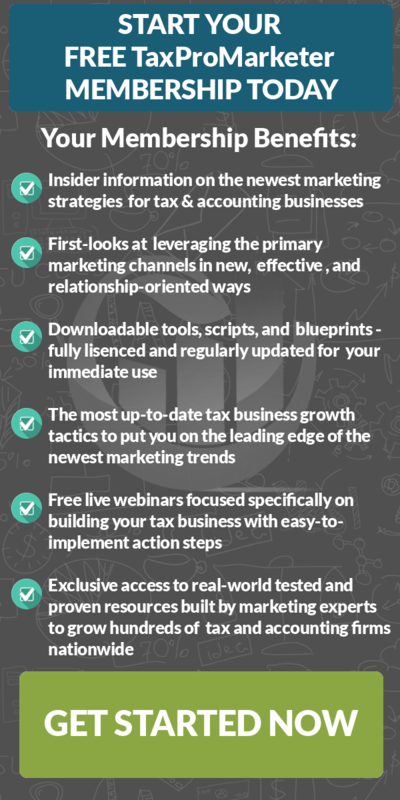 If you have a WRITTEN plan for these 6 areas, you will be poised for breakthrough come tax season. But whatever you do … don’t do nothing.